Source: CICH graphic created using data adapted from Statistics Canada, Canadian Centre for Justice Statistics, Uniform Crime Reporting Survey. http://www.statcan.gc.ca/pub/85-002-x/2015001/article/14211/tbl/tbl01a-eng.htm -accessed July 27, 2017. 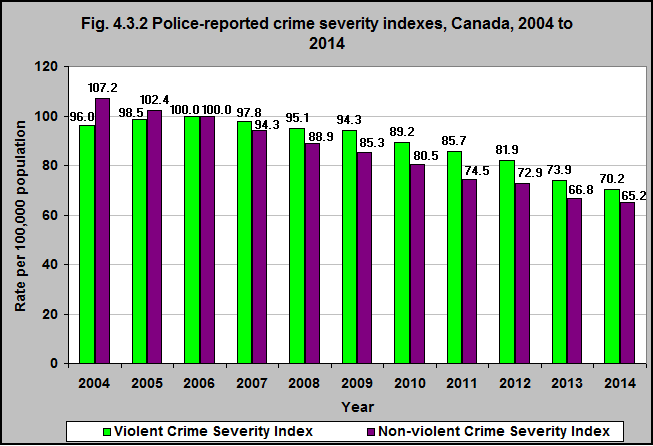 The police-reported crime severity indexes1 decreased in Canada – both for violent and non-violent crime – between 2004 and 2014. Between 2004 and 2014 the decrease in the violent crime severity index was 27%. The decrease was 39% in non-violent crime.